Wings spread, as if mid-flight, the new terminal at Ashgabat International Airport appears from above as a great white bird: a stark, imposing figure against the grey concrete. 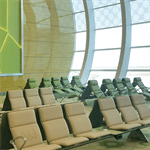 Reopened in 2016, the airport has seen a complete overhaul in design, size and capacity in order to accommodate the rapid increase in both domestic and international passenger traffic in Turkmenistan. The new terminal’s formation was inspired by the international symbol of the country: the Turkmen falcon. The new terminal building has an increased capacity to 14 million passengers, with a total enclosed area of 161,851m2. Also included in the project is the construction of a new 3,800 metre long CAT III runway with Code F capacity that can accommodate the Airbus A380 and Boeing B747-8, the largest existing passenger aircrafts. With the intention of becoming an important stepping-stone between Europe, the Asia-Pacific region and South Asia, the size and significance of the new terminal required the highest internal specification standards. With this came an expectation for premier airport seating facilities. Overseeing the whole operation was Turkish construction company, Polimeks, which sought a seating provider that would be capable of surpassing existing industry standards and delivering a product that was in line with the magnitude, innovation and character of the new terminal. Polimeks soon selected Zoeftig as the seating provider of choice, citing its ability not only to meet the brief, but also to go beyond it and provide new and exciting innovation. Together, the two companies worked to develop several exciting new ideas to bring to the project. 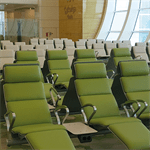 Commissioned to install over 4,000 of its Zenky seating range, Zoeftig ensured that the unique requirements of the airport were met by providing a bespoke two-cushion backrest not previously available in any other airport. Zoeftig also went a step further in meeting client requirements by reducing the size of the backrests so that they fit within a unique steel-edge frame. A specific requirement of the airport was that the angle of the backrest was further inclined; a unique alteration that Zoeftig was able to deliver with ease. Zoeftig also provided 400 Zenky Recliner seats in the ‘Leapfrog’ PVC finish. A specific requirement of the airport was that the angle of the backrest was further inclined; a unique alteration that Zoeftig was able to deliver with ease. Zoeftig also provided 400 Zenky Recliner seats in the ‘Leapfrog’ PVC finish. 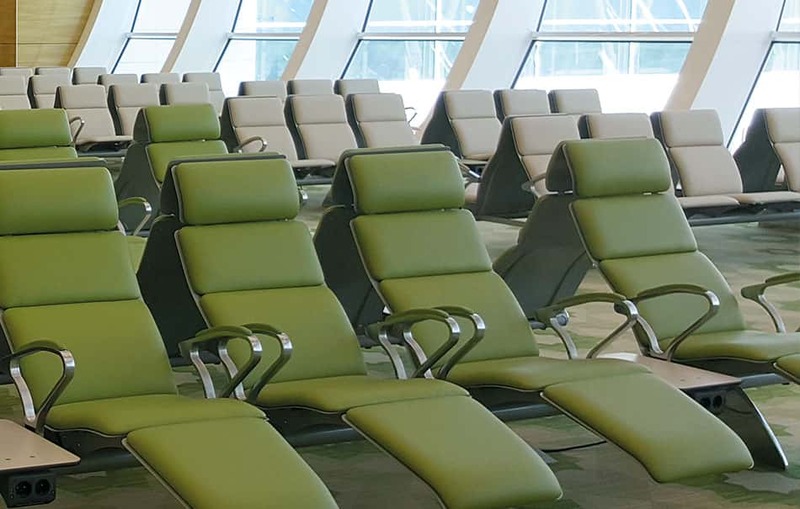 In order to deliver the correct distributions of seats and tables, Zoeftig manufactured bespoke configurations for the airport. Additionally the project included almost 900 half-tables in a Formica Compact Laminate finish in the colour options ‘Pumice’ and ‘Pale Olive’. To accompany these, Zoeftig provided over 800 of its Boost under-table power units, with 1,666 mains sockets and 1,666 replaceable USB sockets, demonstrating its understanding and ability to deliver the increasing requests for power in the ever-evolving digital world. Zoeftig approached the project in a very hands-on capacity, maintaining an active level of engagement throughout the organisation, along with a sharp focus on the quality of detail and service. Due to the high level of custom manufacture, only the highest standards of product and service were permissible for the venture so Zoeftig ensured that it consistently met expectations by undertaking a thorough monitoring process of all custom manufacturing, resources and production before they reached Polimeks. This process guaranteed the highest quality product would be presented to the customer who took a close interest in the final designs and finish of the seating.